EC-Council is sponsoring a 3-Day accelerated training for Microsoft Certified Trainers who are preparing to certify as Certified EC-Council Instructors (CEI), in order to deliver the EC-Council Certified Ethical Hacker program. 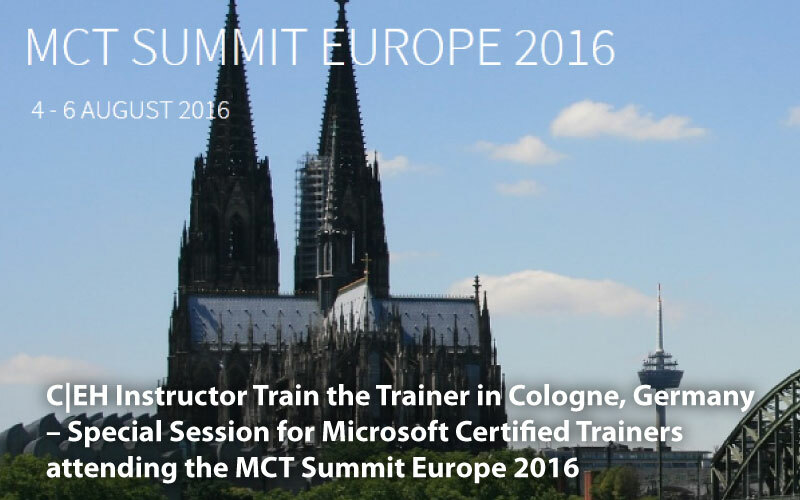 Included in the agenda of MCT Summit Europe 2016 organized in Cologne, Germany at the beginning of August 2016, the training will be delivered by George Dobrea (EC-Council Instructor, MCT & Microsoft MVP, CEO of XEduco Learning Centre). Microsoft Certified Trainers from various European countries, most of them already experienced security consultants are attending this training for an intensive preparation of their C|EH exam. EC-Council is providing the attendees the official training materials, exam vouchers, and access to iLabs – the EC-Council online fully automated cyberattack test platform, in order to get hands-on experience using a complex pen testing environment. “All the MCT’s attending the training are fully committed to continue the preparation in order to register for the C|EH exam. I am pretty sure they will start to deliver EC-Council advanced security training for InfoSec Professionals.” – George Dobrea, the course trainer.